Whether you’re a mountain biker, fisherman, or a family of five with gear to haul to the campground, vacation is not the same without your favorite accessories. 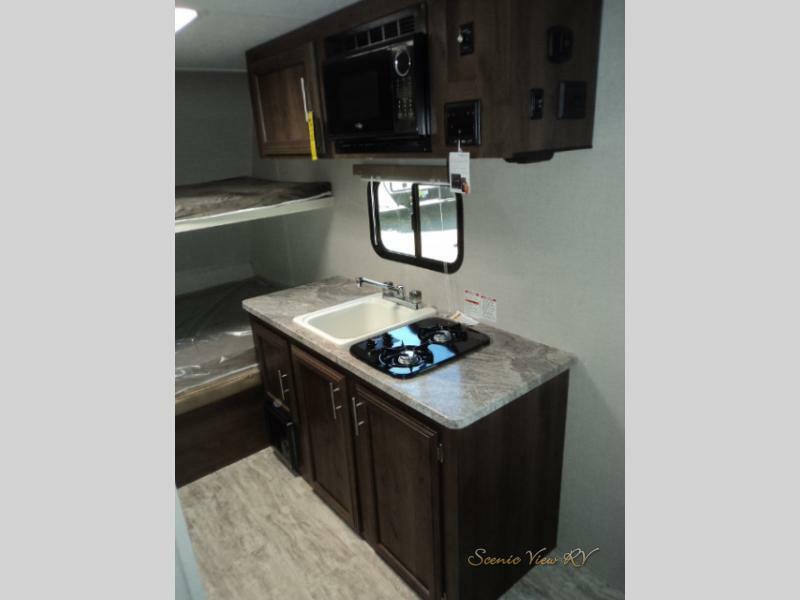 The 2019 KZ Escape toy hauler travel trailers for sale from Scenic View RV offer incredible garage space, enough bedding for up to five campers, and a full bath and kitchen to meet all your needs. Check out this KZ Escape toy hauler travel trailer review to find out more! 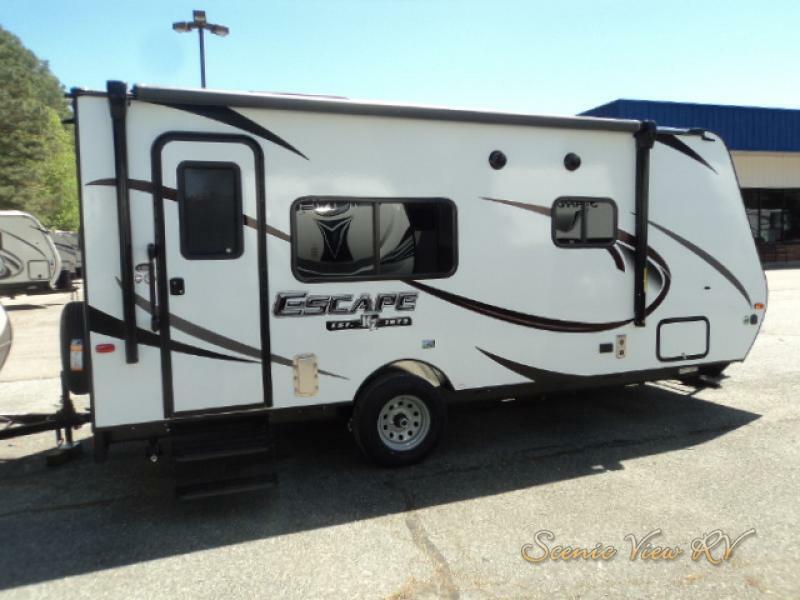 Find more toy hauler travel trailers at Scenic View RV! In the KZ Escape toy hauler travel trailer, you’ll find the easy-load cargo ramp make loading up all your favorite toys a dream! The 9 FT cargo space is big enough to fit an ATV, kayaks, mountains bikes, or more! 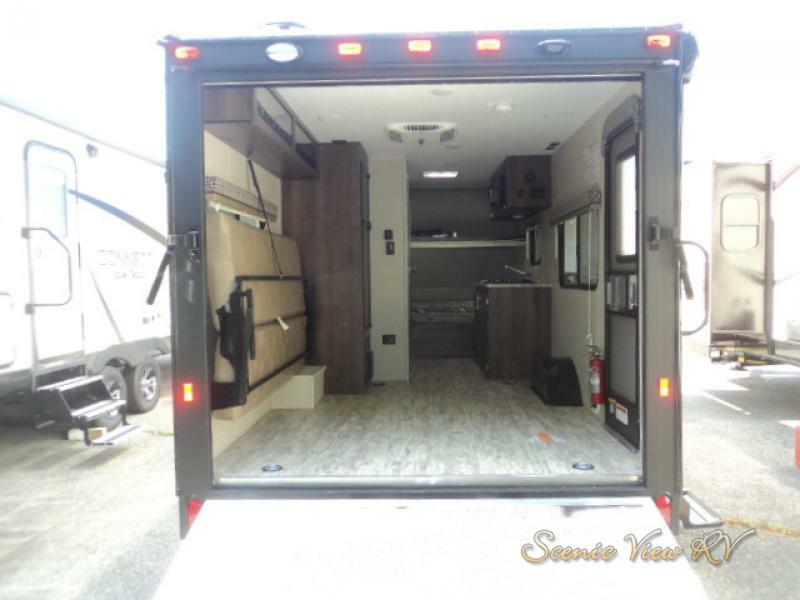 In addition, the fold-out sofa in the garage leaves you extra sleeping space once you’ve unloaded at your destination, so that everyone can sleep comfortably before a day of adventuring. The KZ Escape offers plenty of room for everyone’s must-have toys. The KZ Escape features a front bunkhouse with two full sized bunks! These bunks are the perfect place for the kids to call it a night, or a great solution for taking a vacation with your buddies, so you can all sleep comfortably without disturbing the others. This toy hauler travel trailer easily sleeps up to five campers. A perfect place to retire for the night after a long day on the trails. This little travel trailer is only 21 FT 7 IN in length, but it packs in everything you need for a week away! You’ll find a kitchen, fully equipped with a two-burner cooktop, sink, microwave, and refrigerator. 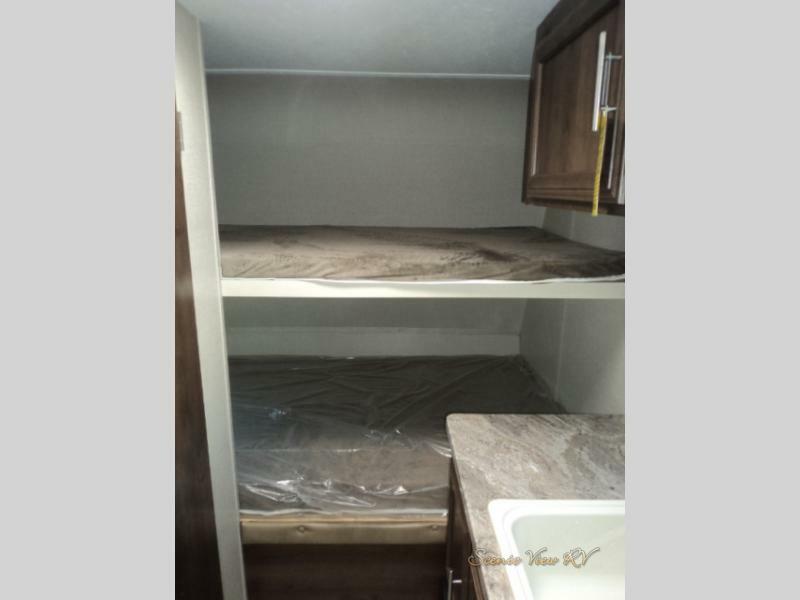 Plus, you can forget those long walks to the bathhouse in the middle of the night, because this little RV has a full bathroom with a shower, so you can enjoy a hot shower in the comfort of your KZ Escape. The quaint galley kitchen is ideal for making a quick dinner after a long day. Don’t let another vacation pass you by without contacting us a Scenic View RV. We’re happy to help you find the perfect toy hauler, travel trailer, or fifth wheel for your family!